Where will you get out of the trade if the stock does not go in your favor? Where will you take profits if the stock does go in your favor? These are the two questions that make up your exit strategy. You have to be able to answer these questions in order to consistently make money in the stock market. A physical stop loss is an order to sell (or buy if you are short) that you place with your broker. A mental stop is you clicking the sell (buy) button to get out of the trade. From a technical perspective, it does not matter which type you use. Note: See this page for why you may not want to use an actual order placed with your broker. Before you get into a trade you will need a plan that will determine when to get out of the trade if it does not go in your favor. You are a disciplined trader that always follows your plan (right?). Whether you use a mental stop or a physical stop, you will always want to exit the trade when you predetermined plan tells you to. Where is your initial stop going to be? You need a stop that makes sense and you need it to be out of the "noise" of the current activity in the stock. Look at the average range of the stock over the past 10 days. If the average range of the stock is, say, $1.10, then your stop needs to be at least that far away from your entry price. It doesn't make any sense to have your stop .25 cents away from your entry price when the range is $1.10. You will surely get stopped out prematurely! You can see in the chart above, that the stock comes down into the TAZ and then reverses with the low at a previous resistance area. 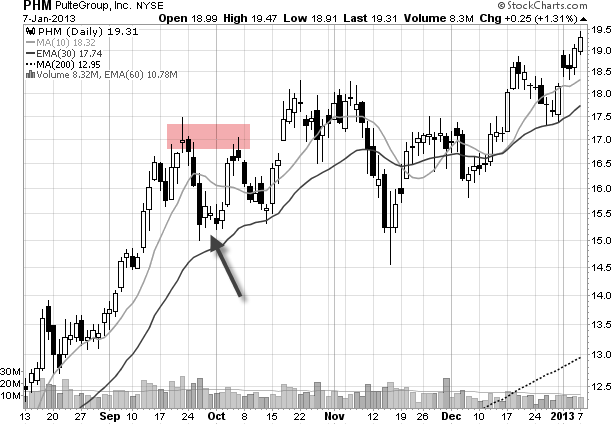 We know that resistance can become support so it makes sense to put our stop under the swing point low (circled). Want a real easy way to set your initial stop? Put you stop loss order under the 30 period EMA. 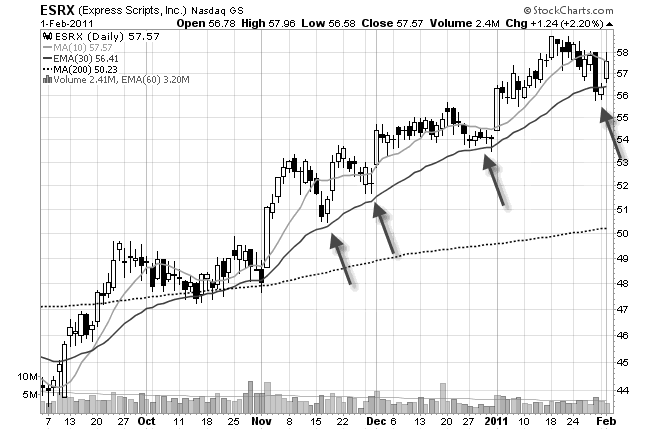 A strong stock should not fall very far below that moving average. If it does then you want to be out of the stock anyway. When you buy or short a stock, you are expecting the stock to go in your favor within a few days. What happens if it doesn't? Do you continue to wait for it to move in your desired direction? No. You will want to sell (or cover) your shares and move on to something else. You don't want to tie up your trading capital on a stock that is just trading sideways. Treat a stock like an employee. If it doesn't do what you want it to do - fire it! Now you know how to get out of a stock if it does not go in your favor. Now we will talk about several exit strategies that you can use to take profits (this is the fun part!). Using trailing stops is an easy and unemotional way of exiting a trade. If this trade is going to be a typical swing trade with a holding time of 2-5 days, then you can trail your stops 10 or 15 cents under the previous days low or the current days low - whichever is lower. The arrows point to the lows of the candles. Your stop loss order would go under these candles. Note: See this page for a more in depth study of using a stop loss order. 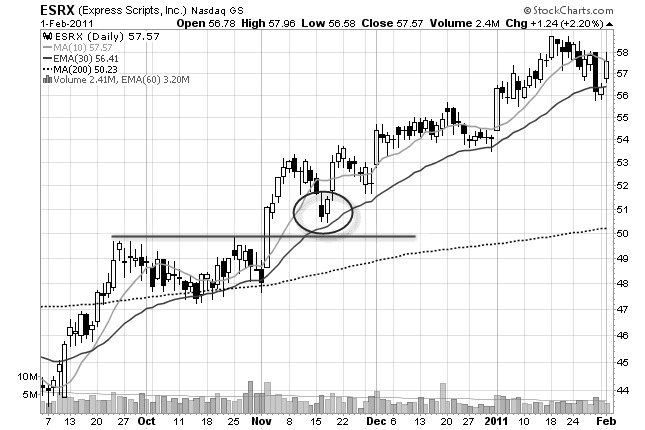 On this chart you would trail your stop underneath the swing point low every time the stock makes a new high. If you bought this stock on the pullback (arrow), then you would sell it at the previous swing point high (red highlighted). A stock is prone to a sell-off once it gets extended above the 10 period moving average. 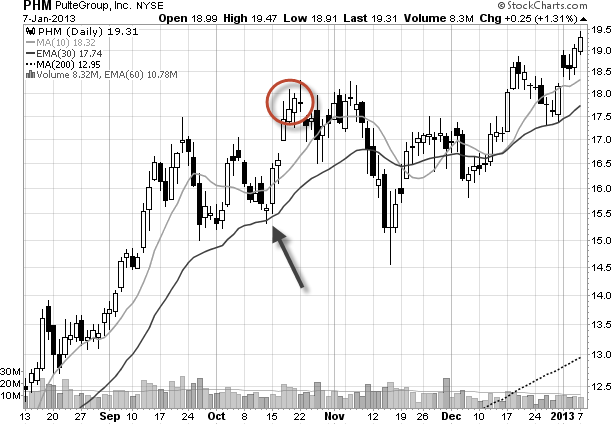 In this example you can see how after you bought the pullback (arrow), this stock exploded through the previous swing point high. You should take profits here. If you would have waited to get stopped out, you may have lost a big portion of your gains. So it makes sense to at least take a portion of your profits off the table (and put a little money in your pocket!). I've tried just about every exit strategy out there. None are perfect. Sometimes you sell too soon. Sometimes you sell too late. That's the bad news. The good news? You do not need a perfect exit strategy to be successful. You just need to be able to protect your money when you are wrong - and take profits when you are right.